Karen was born in Melbourne in 1948 and has a younger brother. Karen’s parents were agnostic – they struggled with being brought up with rigid religious backgrounds that they broke away from – Mennonite in the case of her mother and Baptist/Presbyterian for her father. Karen is an atheist. Karen had a mix of public and private school education – the last five years were at the local high school. Immediately after school, Karen started at Monash Uni studying maths. In her second year Karen had, in her words, “a very good year” and ended by failing all her subjects. A year off from studying followed during which time she went to Tasmania – “I had no clear idea about who I was or what I wanted to do, but I knew that maths certainly wasn’t it”. By this stage, Karen had begun doing long bushwalks in Tasmania. Growing up near Sherbrooke Forest and being encouraged to explore had kindled Karen’s early interest in the bush, and she found the idea of studying something to do with the outdoors very appealing. So she embarked on a degree in geology part time in Hobart. 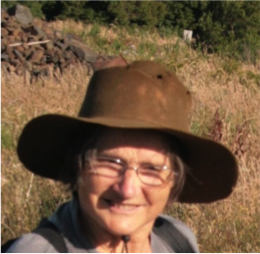 While in Hobart studying, Karen observed the campaign to save Lake Pedder and the role of people such as Olegas and Melva Truchanas, Richard Jones and local campaigner and Tasmanian Environment Centre founder Leigh Holloway, all of whom she describes as “extraordinary people”. She discovered that female geology students were not allowed to go out into the field (this was 1973 before antidiscrimination legislation). In 1974, disappointed in not being able to do field work and wanting to leave Tasmania, Karen moved to Canberra without finishing her degree. She intended to do an education course, but a scholarship to study natural resource management at Canberra CAE fitted well with Karen’s interests. The more practical approach taken by lecturers such as Peter Cullen and John Harris and being encouraged to think about ecology and its application suited Karen’s needs. Karen has been in a relationship with David for 31 years. They first met at the Monash Bushwalking Club as university students, which Karen says is a good place to size up a future partner. “When you’ve seen someone with mud on them, when they’ve woken up with puffy eyes, when they’re grumpy because they’re very tired, then you’ve seen the real person.” But it wasn’t until 1979 when Karen moved back to Melbourne that their relationship really began and they moved in together. For some time Karen had a job that she really enjoyed in rural Victoria, caretaking in a national park, and she managed to save what seemed to be the huge sum of $10,000. This nest egg then allowed her to work on the Franklin campaign for the next 3 years, in an unpaid capacity. A few people in Melbourne – including Margaret Blakers, Ross Scott and John Terrell – were meeting to form a branch of the Tasmanian Wilderness Society, and Karen became part of this effort. In the extract below Karen talks about their early activities, which she describes as being “built on the anger of the loss of Lake Pedder”. Karen worked on the Franklin campaign for 2 days per week initially, which quickly became (more than) full time. As the presence in the office, she became the public spokesperson in Melbourne, coordinator and organiser, and MC for public meetings. I never saw myself as the leader. I just happened to be able to work on the campaign seven days a week. I had the time, and other people didn’t have the time. When I look back on it the skills I brought to it – the skills I learned in observing my parents – were a keen eye and ear for how the group was operating, how you could help the group make a decision, how you could pick out the best of what was going on, and in people, and how you could support people. I wasn’t conscious of those particular skills at the time. I just thought that was how you did it. It was only afterwards that people said that was what I did. We worked really well together, and some of it – not all of it – was because of those skills that I learned in the teenaged years. Karen then went to Brisbane to help with the TWS campaign to protect the Daintree rainforest, but found this a very different experience than working on the Franklin campaign. With the Franklin campaign it was very fluid. You’d grab opportunities as they came up and run with them. With the Daintree campaign you needed a more structured environment, liaison with other organisations and people, and I remember feeling I had no real idea what I was doing. The Daintree campaign needed more considered planning, and more understanding of what my role was as co-Director of this national organisation – it was a huge shift for me from going from just a campaigner, to having this title as co-Director. After Karen left the co-Director position, she moved back to Melbourne. Working with Margaret Robertson she convinced the TWS national decision making body that the organisation should focus on wilderness across the country, rather than fighting individual campaigns. As a result of this Karen became involved in making a series of 6 wilderness films over a period of 4 years (1984-87). In 1988 Karen went overseas for a year, and worked for the United Nations Environment Program in Paris. I rang up David and said I’d just been offered this work and it’s six months. There was a silence, and then he said “I think that’s a fantastic opportunity”. And I knew he’d say that. He’s supportive in a quiet way. He doesn’t block me from doing things, and doesn’t demand more time – he never says “What about me?”. But we’ve had to work at making sure that we don’t live parallel lives – we enjoy eating and talking together, and our big overseas trips away have been really important times for us. Karen was offered more work in Paris, but was concerned that her work there wasn’t having an impact, something which is very important to her – “I need to see things changing in some way” – and she wanted to come back to be with David. So she returned to Australia and took on the job of Environment Manager at ACF, which she held between 1990- 1993. During the interview, Karen and I had a long talk about leadership and management – and how she approached these issues in her ACF position. When she began the job, Karen was concerned at her lack of management experience – she had never done any leadership or management training. In the extract below Karen talks about defining leadership, and about her approach of focusing on “enabling staff to do their job well”. Karen also talks about the impact of the 1991 recession on ACF and on her leadership role. In the 10 years after leaving ACF, Karen worked as a consultant, mainly doing facilitation and strategic planning. She did a Masters of Applied Science at the University of Western Sydney in 2002 and was President of Australian Bush Heritage between 2000-2004 – a period when the organisation underwent considerable growth. There were also some personal challenges – her mother became ill and died, and Karen was getting to know the daughter with whom she had recently reunited after 19 years. At the same time, Karen was working at her local level in the Southern end of the Dandenong Ranges. She was a member of the Environment Management Committee for Cardinia Council and over a period of 3 years helped Council to develop environmental sustainability indicators. In 2005, Karen took on a contract with the Victorian National Parks Association to develop a long term, cross-sectoral campaign to raise awareness of biodiversity and increase its value in the community. She brought together a range of organisations into the Victoria Naturally Alliance and by 2007 had raised sufficient money to support the Alliance. She’s currently team leader of the initiative. It would have been really good, but no. When I started to work for ACF, Deni Greene [environmental consultant] offered me the opportunity, but I didn’t formalise it. I didn’t have an idea of how valuable it would be. But also, I think I’m wary of asking for help for me – I’m very good at asking for help for others, or for the campaign, but not for me. Karen has been inspired by many people including Bob Brown, Judy Henderson and Judy Lambert and she really admires people with a capacity to focus on one thing and get it done. She admires Gwynneth Taylor, the first female president of the Victorian NPA, “for her capacity to ask a particular question, which may not have an obvious immediate answer, but it would get you thinking”. As I’ve got older, I understand more about what I do well. As I understand this, I can then use my skills more effectively. I do have the capacity to see the underlying need, and the capacity to see how you might act on that need. As I’ve become older I’ve become more confident, and I’ve been able to argue for the solutions that I think are right. The last extract below is of Karen talking about the differences between women and men in leadership. Seeing some change, seeing something operating well – that’s the reward of leadership. The difficulties arise when you have to make hard decisions – perhaps when you haven’t had time to consult properly, and you might get bad reactions. I sometimes find it difficult to take the full responsibility of leadership, as it can be very stressful. The impact can be high on your sense of well being, and that has put me off leadership at times – I don’t want to feel that extra sense of stress. I’m glad there’s a pension. I won’t have enough superannuation. But I have found that so long as you’re not paying out a lot of money for a huge mortgage, you can live quite well, by living fairly simply. Finally we talked about why women might not want to become involved as leaders in the environment movement. There’s not an active program of support for women to become leaders in the environment movement. Such a program might include discussions about what leadership is, what you might bring to leadership, how you might be trained in leadership roles. It may also include a recognition of the current leadership roles, a mentoring system. I think that the leadership styles that are the role models need to be expanded … while it’s still considered to be narrow, political head bashing stuff – I think it’s a bit of a barrier for women. It would be fantastic if the notion of leadership could be expanded – so a leader is not just a prime minister or CEO. This would then enhance everyone’s capacity to see where they can play a leadership role. Nearly everyone would find themselves in some leadership role. This would then provide value to that person – it’s an empowering notion. It’s disempowering when it is implied that one person is the leader and the others don’t have the skills. Any good CEO knows that they rely on the leadership skills of staff, although not many acknowledge it. I have found, in general, that women are better able to acknowledge the roles that others play, and thank them. For the blokes it’s not so easy– because that’s giving away power. This entry was posted in Alexander, Karen, Women leaders in the environment movement. Bookmark the permalink. Karen is an amazing activist. Thanks for producing this profile on her. Karen was an absolute inspiration to me when I was a fledgling environmental campaigner. Wise, patient and clever, I’m forever indebted to her. Thank you for your email regarding Karen Alexander’s outstanding contribution to the environment movement. The Wilderness Society greatly appreciates her fantastic contribution to wilderness protection over the years. In response to reqesting from women who came together on Friday 12 October 2012, I am testing whether further comments can be added to the existing blogs now that we sadly nolonger have Jane with us. It seems that this is possible and I can monitor the blogs and note any new additions.